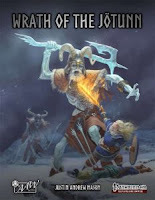 I'm excited to announce ethat "Into the Wintery Gale: Wrath of the Jötunn" (AAW Games / Adventureaweek.com) has received a 5-star + seal of approval rating from Endzeitgeist! The title was also made a candidate for the Top Ten of 2017! This mega-adventure can be purchased via Adventureaweek.com, DriveThruRPG, RPGNow, Steam, Fantasy Grounds, and Paizo.